From July 1906 "Machinery" magazine, from Google Books, with thanks to Joel Havens. Dwight Slate was born in Gill, Franklin County, Mass., May 29, 1816. At the age of 17 he entered the machine shop of Eli Horton, Stamford, Conn., as an apprentice, but so apt was he in mechanical and business sense that before the term of his apprenticeship had expired he was made a partner. Horton manufactured textile machinery and also built various machines to order, which work gave Mr. Slate very valuable experience. During the twelve years of service with the Horton shop he designed a number of new machines, among which was one for rifling gun barrels with what is known as the "gain twist." Leaving the Horton shop in 1845 he formed a partnership with F. M. Brown, the concern being known as Slate & Brown, which located in Windsor Locks, Conn. Here a shop three stories and basement, 40 x 80 feet, was built, where they made textile machinery and fitted up many textile mills in Massachusetts and Connecticut. They also built special machines to order, and when Col. Colt received his first order from the United States government for revolvers, Slate & Brown made, on contract, barrels and cylinders for Colt's revolvers, which were used to a limited extent during the Mexican War. Mr. Slate designed a number of special machines and tools for revolver manufacture, and many of the machines of his design were afterward used in Colt's Armory, where they proved to be very valuable. At this period the planer was a machine tool found in very few American shops and Slate & Brown installed one of the first iron planers to be used in the Connecticut Valley. With it they did much planer work for other machine manufacturers, work being sent to them from towns as far distant as New Haven. Finding their venture so successful they shortly after got out patterns and started to build planers, which were among the first of the rack and gear type in this country. One of the first of these was sold to Geo. S. Lincoln & Co., of Hartford, afterward known as the Phoenix Iron Works. Planed surfaces were then produced in most shops by chipping and filing, and when Slate & Brown announced to their workmen that they had ordered a planer for their shop, some of the men wanted to strike, as they thought it would deprive the chippers and fliers of their means of livelihood. Early in the year 1850 Mr. Slate ventured into the Southern field, going to Augusta, Ga., to install textile machinery in some of the cotton mills then being located in that vicinity. He remained in the South about five years, during part of which time he was connected with the Augusta Machine Works, which afterward built railroad cars. Shortly befora the outbreak of the Civil War, he returner north and became a general contractor in Colt's Armory at Hartford, where he made important improvements in the methods of manufacture of firearms, bringing out among other inventions an improved rifling machine which is practically the same as that used in nearly all of the government armories at the present time. With the close of the war the demand for firearms of all kinds practically ceased, and leaving Colt's he became connected with the comparatively young firm of Pratt & Whitney as a designer of tools and machines. It was with the Pratt & Whitney Co. that he invented and patented the lathe taper attachment for turning tapers on the engine lathe without setting over the tailstock, which is now in general use. This patent he sold to the Pratt & Whitney Co. for $10,000, and it Is conservative to state that it was one of the best investments that Pratt & Whitney Co. ever made. It was a basic patent and was never contested during its life. It gave the Pratt & Whitney lathe great advantage for toolroom work, and in many cases formed the thin edge of the wedge by which a great volume of business was afterward secured. Early in the seventies Mr. Slate started a shop of his own in Hartford to build special machines for various purposes. 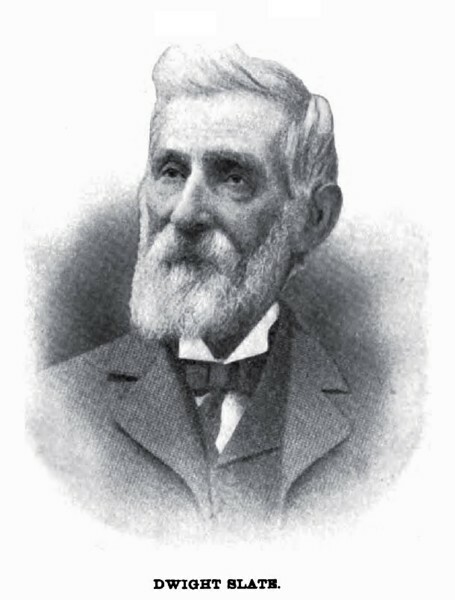 About this time he got up and patented the Slate cut-off tool and a center grinder for grinding lathe centers; he also originated the type of small drilling machine known as the "sensitive drill," that is, the machine which in its original conception was so constructed that the driving belt would slip before the drill would break. The so-called sensitive drill of the present day of course is wide of the mark in this respect, but the direct application of the driving belt to a pulley on the drilling spindle, together with other features, which mark this design, have made this machine one of the most valuable of small machine tools. In 1885 Mr. Slate Incorporated his business under the present name of the Dwight Slate Machine Tool Co. to manufacture a line of light machine tools, most of which were of his own design. He is now nearly 90 years old, but is still in good health and takes great interest in current events of the day, although not engaged in active business.